So who needs this truck, this behemoth that is essentially one of the most powerful and capable pick-up trucks a person can drive without a commercial trucking licence? I guess it would be someone that has towing and hauling requirements that push past the limits of today’s light-duty trucks, which are no weaklings in their own right. If this is you, you have a dizzying array of possibilities when it comes to ordering your truck. Five trim levels, three cab sizes, two- or four-wheel drive, two box sizes/wheelbases, different axle ratios and yes, of course the option of gas or diesel engines. Once you wrap your head around this, you’ll eventually figure out what suits you best. 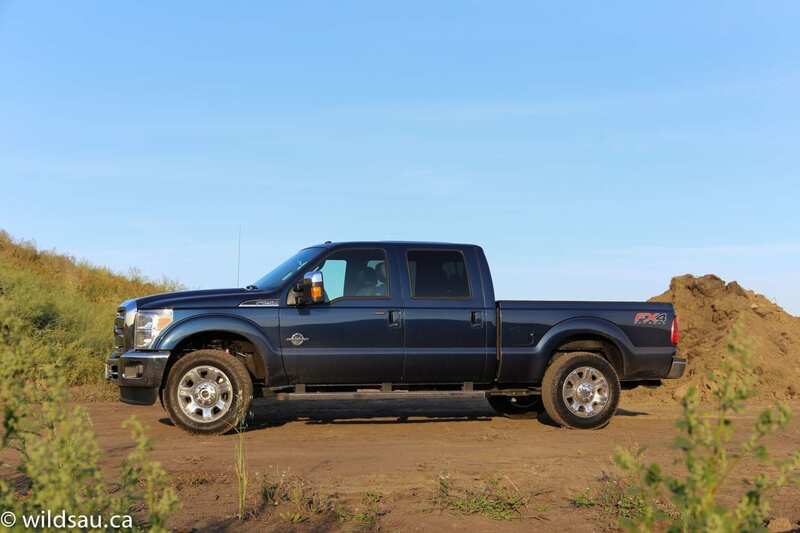 For the record, this truck is pretty much a carry-over from the previous F250 with some tweaks under the hood, netting the driver some more horsepower and torque without affecting the truck’s fuel efficiency rating. Let’s start at business end. What could possibly justify a $10,000 upgrade price under the hood? 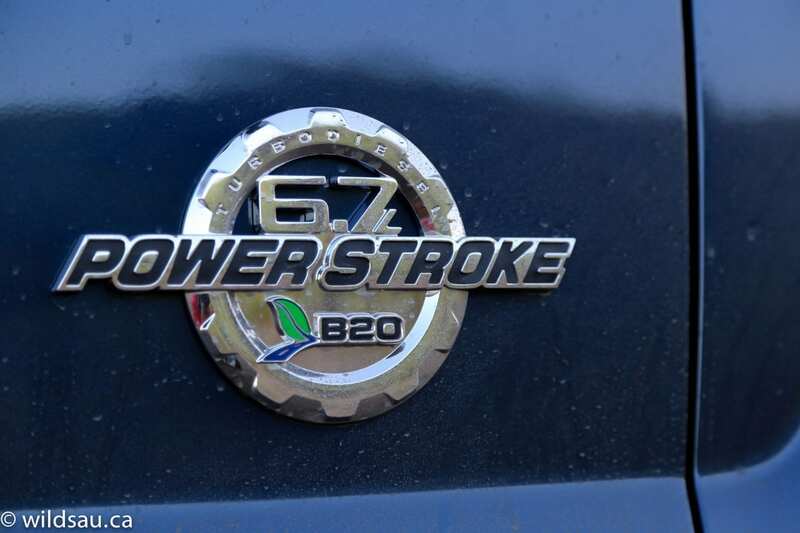 Well, Ford thinks you’ll want their Power Stroke turbo-diesel 6.7-litre V8 so badly that you’ll be willing to pay dearly for it. What do you get for that lofty option price? Well, the important part is 860 lb.ft of torque at 1600 RPM. That’s stump-pulling power. If you care about horsepower, which matters very little in a vehicle like this, the diesel puts out 440 horsepower at 2800 RPM. 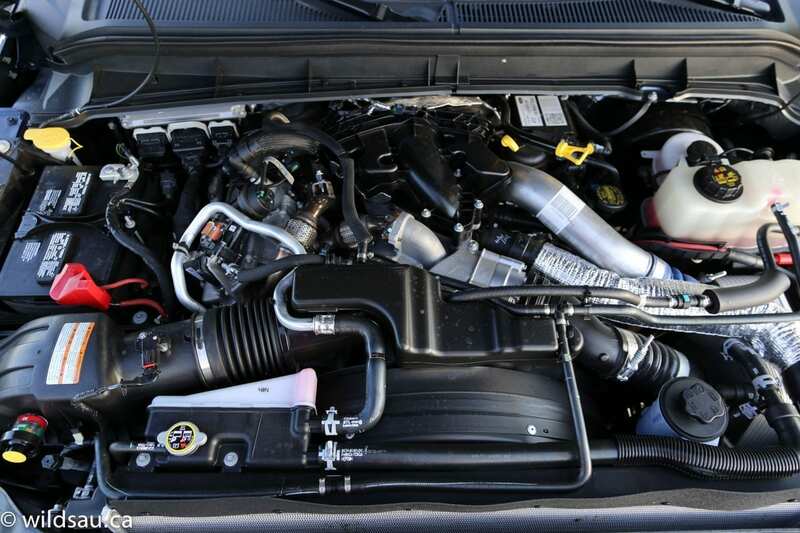 The F250 gets a 6-speed automatic and a surprisingly small 98 litre fuel tank. It goes up to 142 litres in long wheelbase models. All that to pull a gargantuan, 3385 kg (7463 pounds) beast around. Fuel efficiency is laughable, of course, but if you care, I averaged 17 L/100 km (14 US mpg) during my week with it, excluding the period of time when I did the towing test. That’s actually not terrible, if you take everything into consideration. 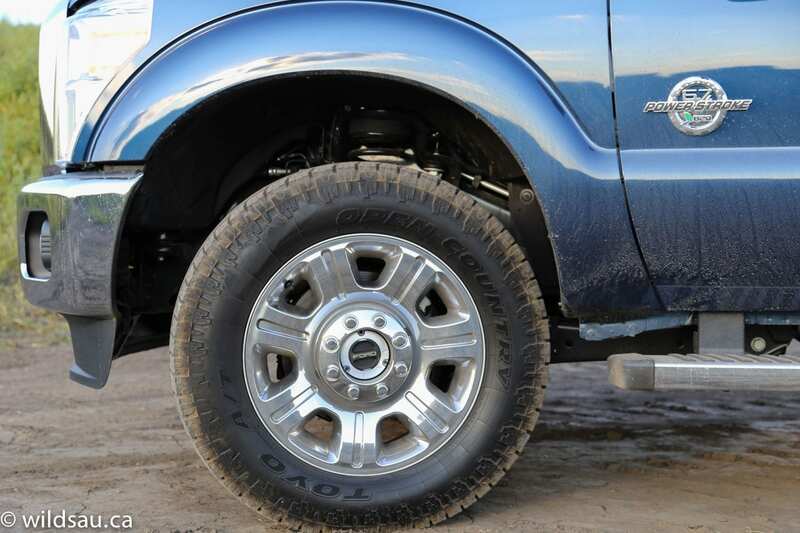 While it’s basically old news, there is a noteworthy item when it comes to the truck’s exterior. The grille! LOOK AT THAT THING! You can’t miss it. And neither can the person in front of you. I constantly saw people checking their rear-view mirrors when I was following them and almost immediately ducking out of the lane, likely pulling over to check their shorts. It’s a frightening proposition to be ahead of a truck like this, knowing that one stab of the throttle could likely propel this leviathan directly over your vehicle. The fact that the entire thing has been slathered in chrome ensures that you can see this F250 from space. The truck’s size can’t be understated. It is simply a massive pick-up, even dwarfing mortal half-tons parked beside it. But other than the grille, you won’t find a lot of things that stand out visually. Make the big step up into the truck and you’ll be greeted by an interior that is spacious and roomy (including nearly enough headroom for a cowboy hat) but is certainly starting to show its age. You’ll find what seems like hectares of hard, old-school plastics. The fit and finish isn’t that impressive, with some of the plastics on the door panels and the centre console standing proud and offering up sharp edges for you to catch your pant leg on. Oh and then there’s that “wood” trim. It looks like it was made by Tupperware. It’s awful. The heated and cooled power-adjustable leather seats are very comfortable – around town and for long-haul trips. You can further customize your driving experience with the adjustable pedals, moving them closer or further away. The stack has the MyFordTouch system sitting front and centre. Below it are the controls for the media system as well as the automatic (dual-zone) climate control system. Many of the knobs are chunky, making them easier to use with gloves on. I like that Ford puts a 12V plug as well as a household 115V plug right on the dash. The inside door handles are meaty and the door latches are vertical, meaning you can easily get a gloved hand in there, squeeze the grip and get the door open. There is a lot to work with here, and while the cabin is functional and relatively pleasant, it feels like it comes up a bit short in the quality department. That might seem trivial since we’re talking about a “work truck”, but plenty of consumers end up commuting with these things or taking them on extended vacations with RVs, and the shortcomings become especially obvious in light of the truck’s nearly $80,000 asking price. Three seats, each with a seatbelt and headrest, make up the second row. There is ample space here, from head room to leg room. Rear passengers get adjustable air vents, another 12V plug and a household 115V plug. There are a plethora of places to put your stuff, and that’s very important to many who will use this as a work truck. You’ll find a large pop-up lid on the dash, concealing a rubberized bin which is ideal for your phone, media devices, etc. It keeps them hidden and out of the dust in the main cabin area. There are also two USB plugs and a 12V plug in there for charging. The console has four cupholders, all of which are removable, exposing a deep storage well underneath. Behind them is a massive armrest, and under the lid is further space with organizational tools, another 12V plug and a flexible tray. Very useful. You’ll also find vertical storage slots on the sides of the console, which would easily hold file folders. 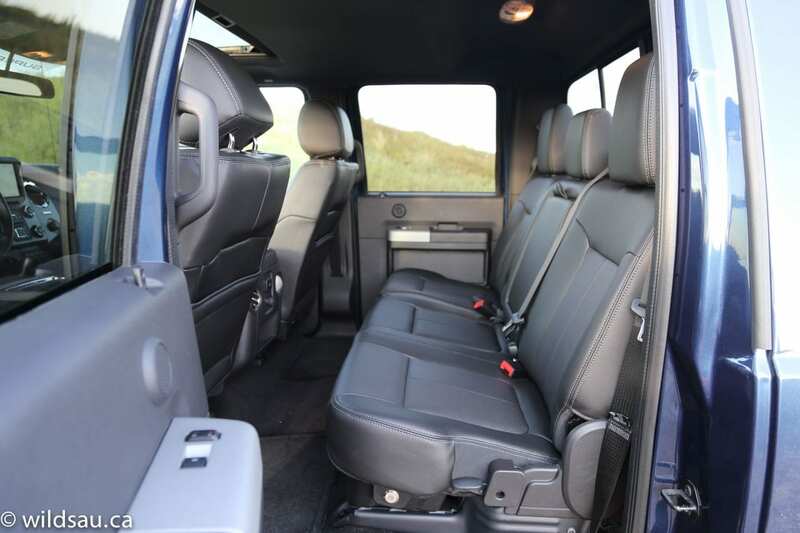 The rear seats split 60/40 and the seat bottoms fold up, making for a massive space to transport things inside the rear seating area if you need to get whatever you’re moving out of the elements. 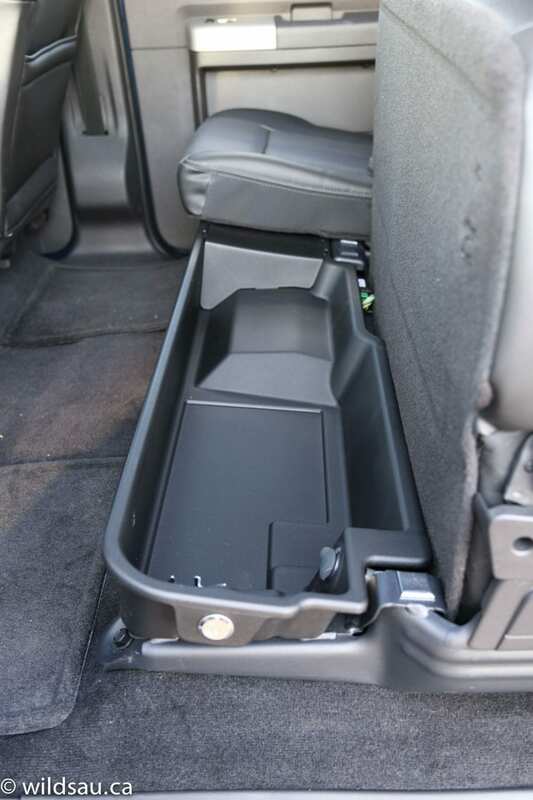 Folding up the seat cushions also exposes large, lockable storage bins – one under each seat. A nice secure option to stow things and to top it off, the bigger bin includes a 12V plug. 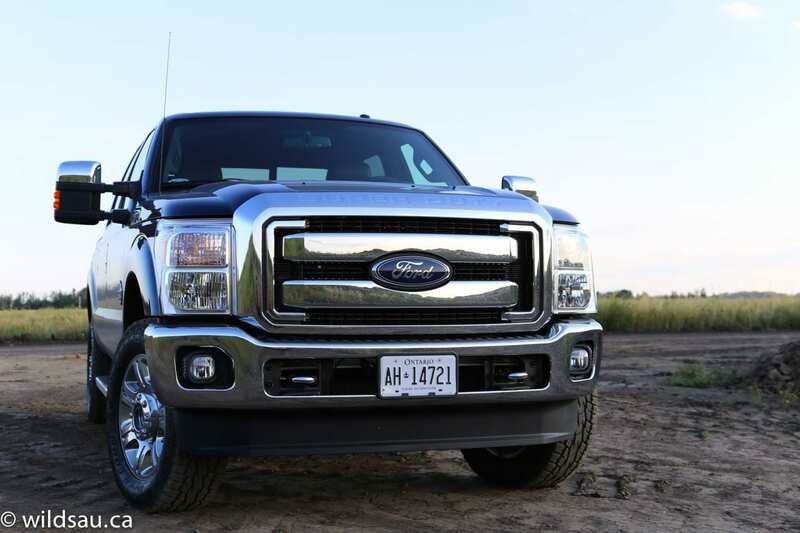 The F250 feels big because it is big, but it remains (surprisingly) very drivable, even around town. Sure it’s not a pleasant vehicle to commute with, but it can be done for those that have committed to a massive, heavy-duty tow vehicle that they’re forced to use as a daily driver during the other 98% of the year when they’re not towing. You just need to be conscious of its size as you change lanes. 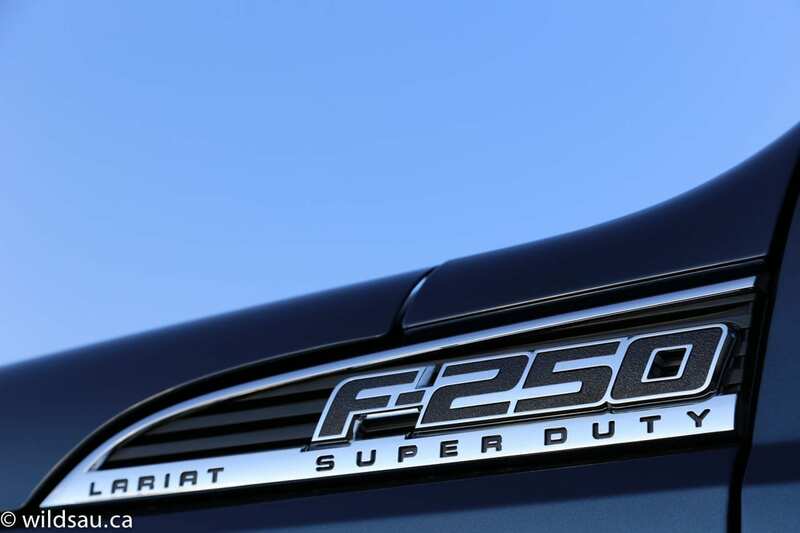 Off the line, the F250 has plenty of power and if you ask it to, it launches with authority. Frankly, at any point in time, if you need power, you just need to step on it and you’ll get the power you’ve requested. Just don’t expect it to show up quickly. Obviously the engine isn’t the issue. It’s the transmission. While smooth for the most part, the 6-speed automatic makes things downright frightening when you step on the gas, trying to get into a gap in traffic or attempting to pass. The problem is that a downshift can take 2-3 seconds sometimes. And that makes for some heart flutter. I don’t know if that’s designed to control the massive torque the engine puts out or what the deal is, but it really does take time to get moving. Once things get going though, this sucker moves! 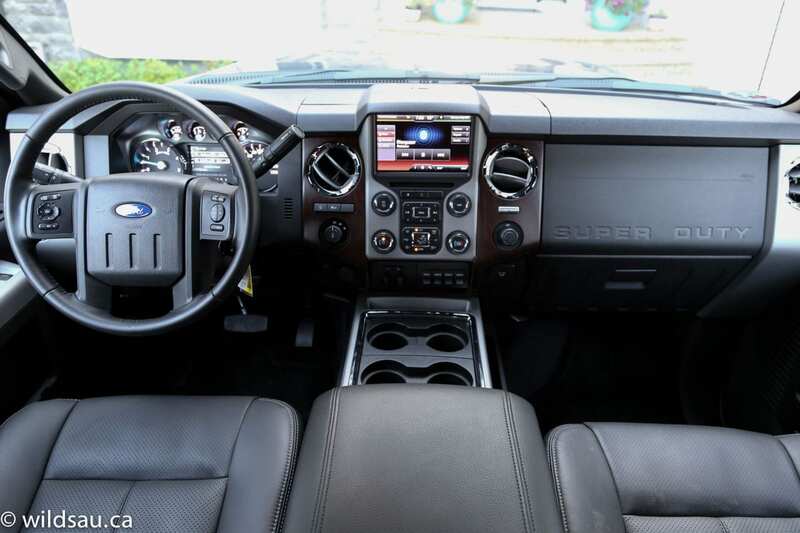 The Super Duty’s unladen ride quality is what one would expect from a heavy-duty truck – it bounces, it jiggles and it twerks better than Miley Cyrus over rough roads. Now, the words “handling” and “heavy-duty truck” rarely end up in the same sentence but it holds its own around town and is easy enough to control and guide into the spot you want to end up in, much like a Navy battle cruiser is easy is guide into port – it takes a lot of space and some concentration, but you’ll get there. 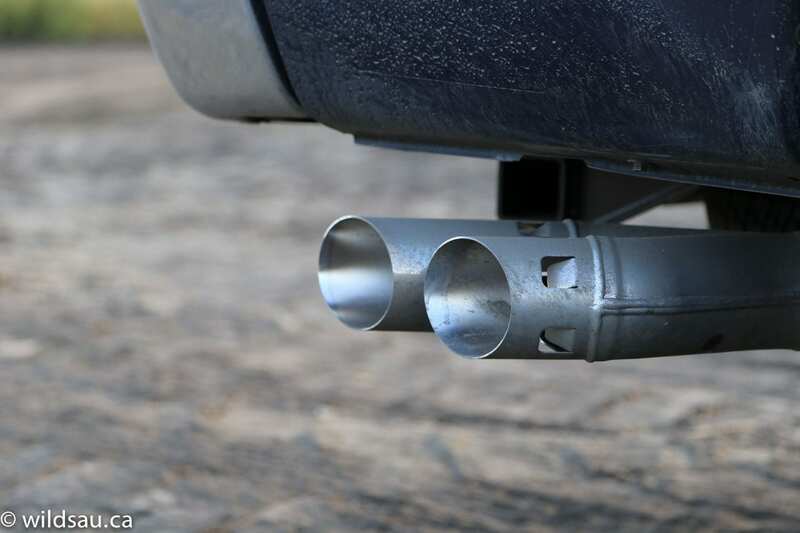 Engine noise levels are noticeable but not terrible – you’ll get some diesel clatter, especially under load. I was pleasantly surprised at how well the wind noise is controlled at highway speeds. The fly in the noise ointment was the road noise – the tires create a terrible racket at any speeds over 70 km/h. Very, very intrusive and irritating and it gets worse as you drive faster. Visibility out of the vehicle is great toward the front and sides, but even after folding the powered mirrors in and the rear-view camera in action, parking it is a chore. Also, the rear headrests are very intrusive. Ford claims it has the best in-class tow ratings, but really, nobody cares, since no one gets to wear the crown in this category for long. With each successive model update, each of the truck manufacturers can make this claim at one point or another. Suffice it to say, this truck can pull. Equipped with the diesel engine, it is rated for regular towing up to 14,000 lbs (6350 kg) and for 5th wheel/gooseneck towing up to 15,900 lbs (7212 kg). Payload is also impressive, with a load maximum of 3150 lbs (1429 kg). I performed a tow test, pulling a large 6,500 pound (2948 kg) RV trailer around the countryside for a little while including up and down a fairly significant 7% grade. The diesel powertrain is very, very impressive, and takes an awful lot of stress out of towing, even with improbably heavy loads according to a couple of people I spoke to who have towed much bigger, heavier loads with an identically-equipped truck. I have also tested the F250’s payload capabilities – not during this week but at a Ford event, when I drove essentially the same truck with a 3000-pound payload (in the form of lashed-down road-working equipment in the box). Truthfully, it was as if the truck didn’t even realize someone had added something to its box – the only impact it seemed to have was to smooth out the ride nicely. 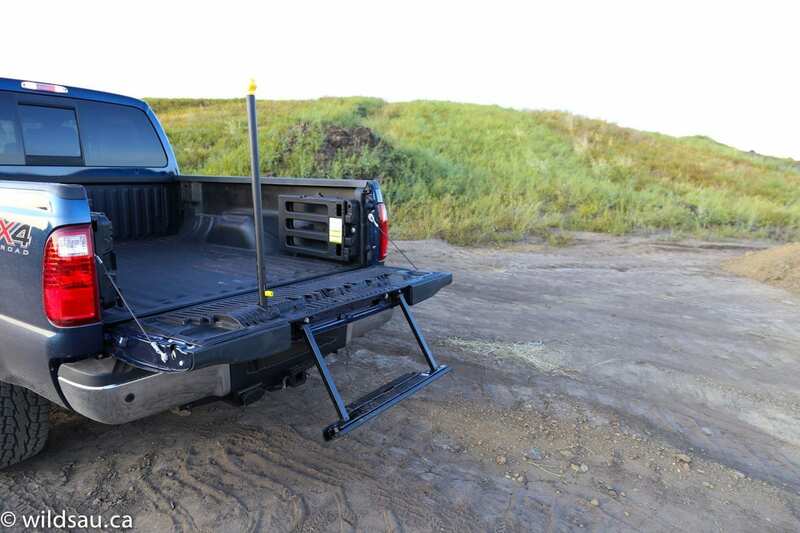 Speaking of payload, getting up into the truck’s box is made easy thanks to Ford’s built-in tailgate step and handle. Opted for the short box model but need to move stuff that’s longer? No problem with the bed extender, conveniently stowed on either side of the box. 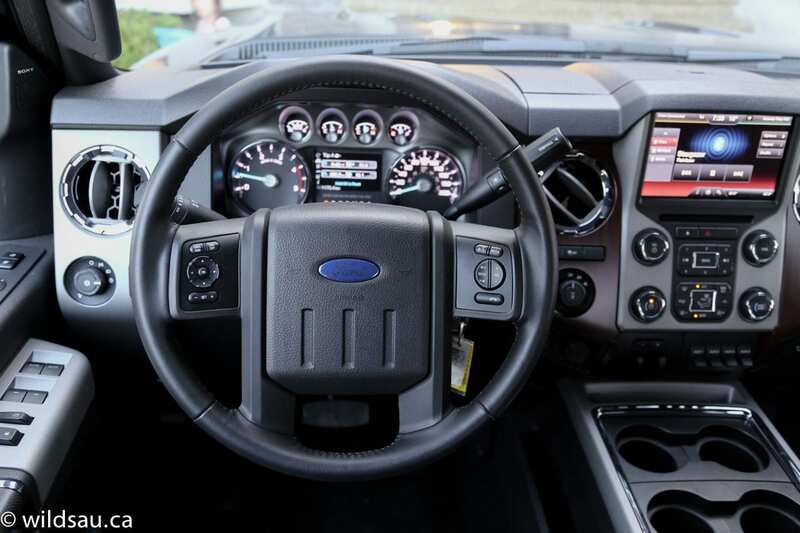 Unfortunately, when I got on the road, I found the Super Duty’s steering quite imprecise and floppy – steering feel isn’t just for sporty rides, it also impacts me when I’m towing with a big rig like this, and frankly I wasn’t always as confident as I wanted to be when trying to maintain my rig and trailer in my lane. 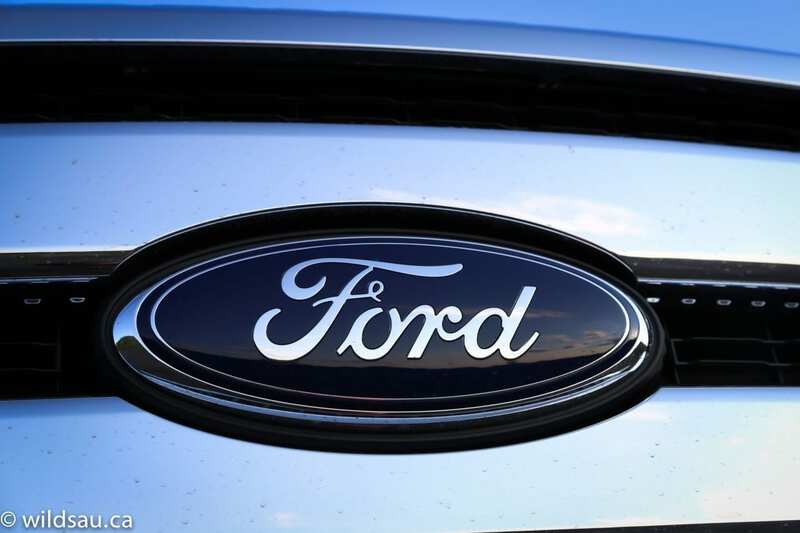 In terms of helping you get you and your cargo to your destination safely, Ford also includes an integrated trailer brake, a manually-switched exhaust brake and powered extendable towing mirrors. 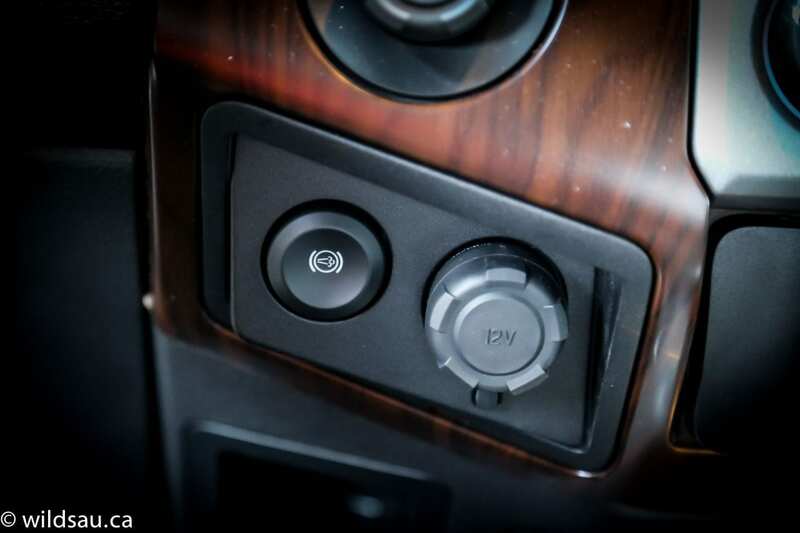 4×4 modes can be electronically shifted on the fly using a dash-mounted knob. 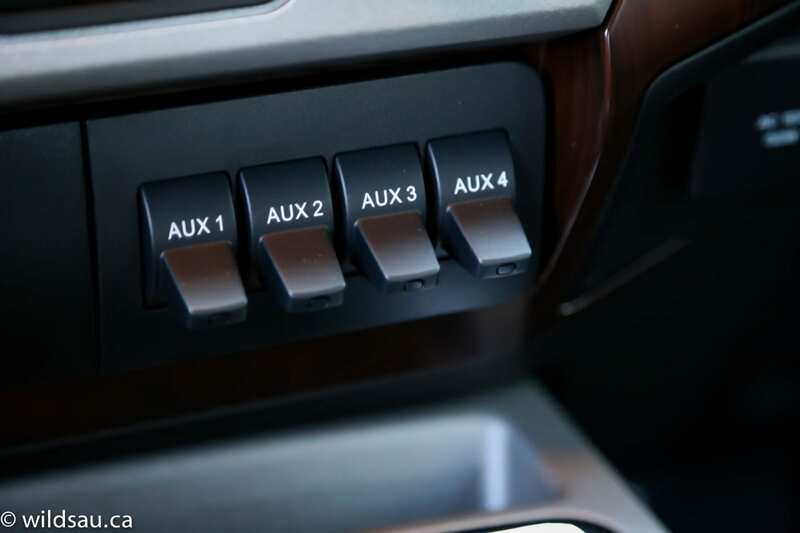 And the four “upfitter” switches on the centre stack are perfect for controlling power to after-market auxiliary accessories such as light bars, a winch, etc. 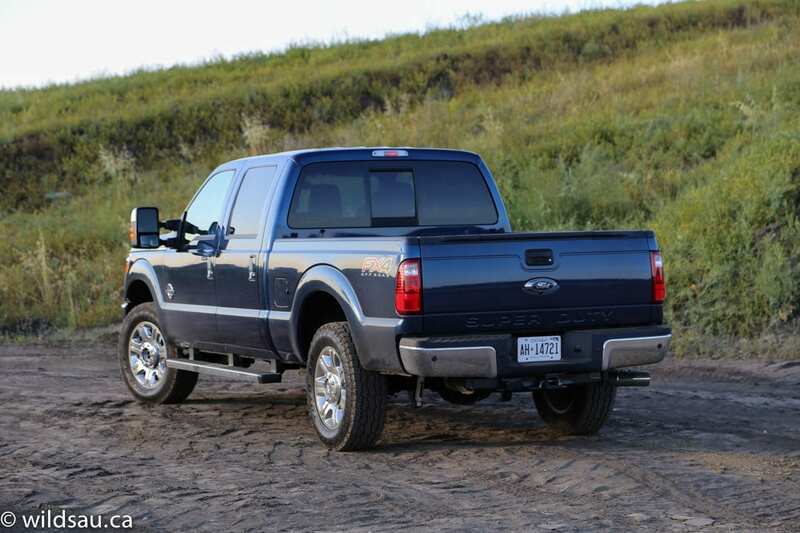 Obviously when it comes to a leviathan like the Ford F250, you don’t review it as you would a normal vehicle. This isn’t a normal vehicle. It is a heavy-duty truck that has extraordinary strength and is built to move things. If that’s what you need, this is the truck for you. Is it better than the competition? Who knows? I don’t. I haven’t tested other heavy-duty trucks, but I suspect they all do their jobs well and probably sport remarkable similarities in how they go about their jobs. 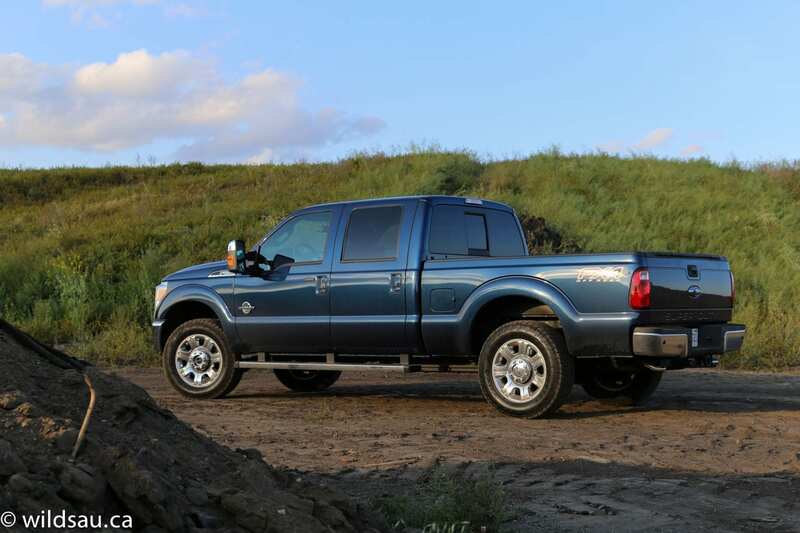 In this case, the F250 is tremendously capable. WAF (Wife Acceptance Factor) was low. She’s not a fan of big vehicles, having recently downsized her minivan to something she enjoys driving very much. She didn’t like the size of it, and felt very uncomfortable driving it, parking it and even being seen in it. Yet, she loved that it could tow an RV with ease and she enjoyed the space it offered for the kids in the second row. Her opinion is of little value here though, as this truck would be bought with a purpose, not as a generally pleasant vehicle. 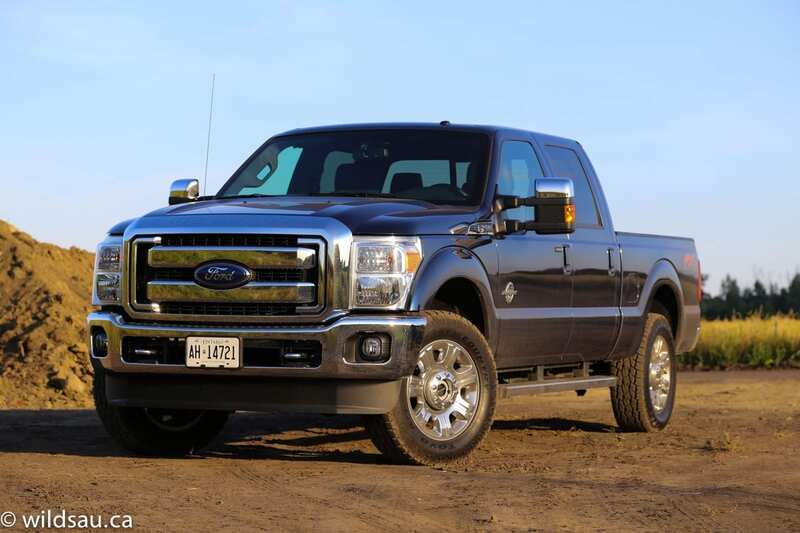 While the Super Duty’s capabilities, especially with the Power Stroke diesel, are impressive, it’s important to maintain some perspective here. 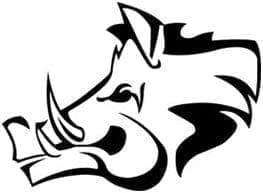 If you are not hauling or towing extraordinarily heavy loads on a regular basis, a decently-equipped half-ton pick-up would likely suit your budget and your needs better and on a daily basis, you’d benefit greatly from having a more livable truck. But if it’s maximum work you’re after, or you just have a desire to frighten small children, the Super Duty F250 is tough to beat.